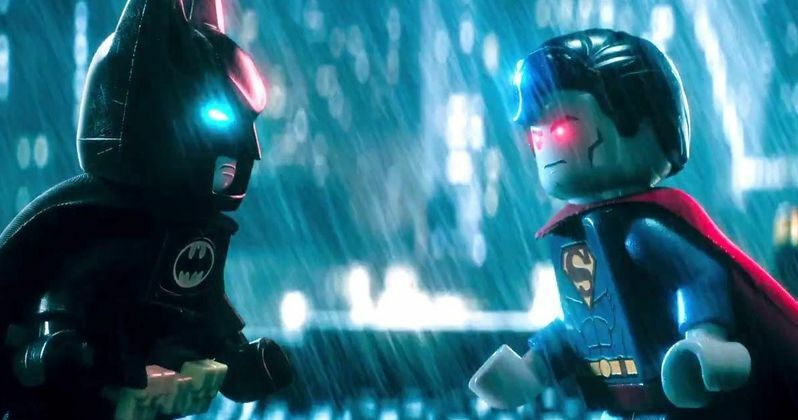 Warner Bros. pokes fun at their own blockbuster Batman v Superman: Dawn of Justice in the fourth trailer for their highly-anticipated LEGO Movie spin-off, The LEGO Batman Movie. This trailer includes a new scene where The Joker (Zach Galifianakis) dares Batman (Will Arnett) to come and catch his greatest enemies, but the villain becomes quite confused when Batman claims that his greatest enemy is Superman. We also get new looks at Rosario Dawson's Batgirl, Michael Cera's Robin, and Ralph Fiennes' Alfred Pennyworth. In the irreverent spirit of fun that made The LEGO Movie a worldwide phenomenon, the self-described leading man of that ensemble - LEGO Batman - stars in his own big-screen adventure. But there are big changes brewing in Gotham, and if he wants to save the city from The Joker's hostile takeover, Batman may have to drop the lone vigilante thing, try to work with others and maybe, just maybe, learn to lighten up. Warner Bros. has set a February 10, 2017 release date, which is shaping up to be quite the competitive frame. The LEGO Batman Movie's release date puts it up against two highly-anticipated sequels, Universal's Fifty Shades Darker and Lionsgate's John Wick: Chapter 2. Will Arnett voiced the mini-fig version of Batman in The Lego Movie, which became a huge box office hit, taking in $257.7 million domestically and $469.1 million worldwide, from a $60 million budget. That movie's success lead to Warner Bros. announcing a number of spinoffs, with The LEGO Batman Movie leading the way, followed by Ninjago (September 22, 2017) and The Lego Movie Sequel (May 18, 2018). The voice cast also includes music icon Mariah Carey, playing Mayor of Gotham Marion Grange. Earlier this summer, we also saw that the iconic villain Harley Quinn will be featured. It has been revealed that Jenny Slate will lend her voice to this DC villain. Margot Robbie recently portrayed Harley Quinn on the big screen in this summer's box office hit Suicide Squad. The LEGO Batman Movie is directed by Chris McKay, who is best known for directing several fan-favorite episodes of the Adult Swim series Robot Chicken and Moral Orel. He is working from a script by Seth Grahame-Smith, Chris McKenna, Erik Sommers, Jared Stern and John Whittington. The story is based on Batman and other characters created by Bob Kane and Bill Finger for DC Comics. Take a look at the new trailer for The LEGO Batman Movie below.